How many merger binary black holes are there? There are lots of uncertainties in our understanding of stellar evolution. 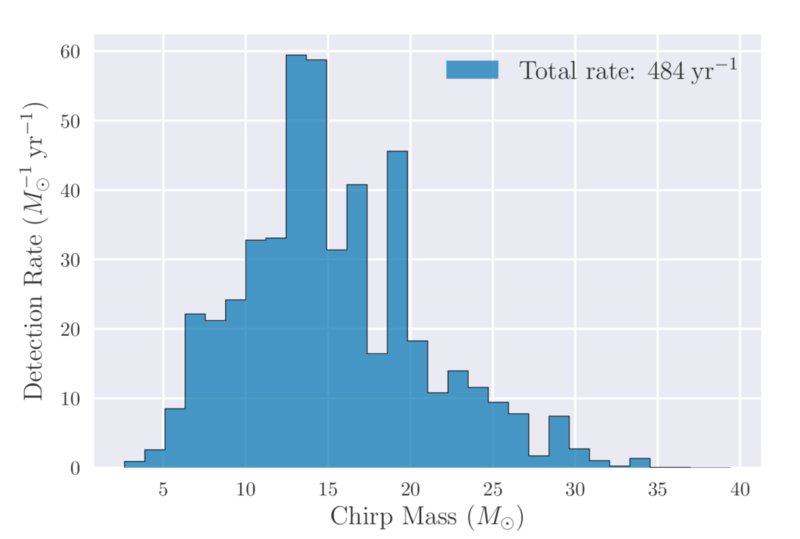 This plot shows one prediction from the COMPAS population synthesis code for the number of gravitational-wave detections: there would be about 500 detections per year of observing time once our detectors reach design sensitivity! In Barrett, Gaebel, Neijssel, Vigna-Gómez, Stevenson, Berry, Farr, & Mandel (2018; http://adsabs.harvard.edu/abs/2018MNRAS.477.4685B) we investigated how we can use the measured detection rate and distribution of chirp mass to constrain some of the uncertain parameters of stellar evolution. We found that we could constrain parameters describing mass loss rates, supernova kicks and common-envelope efficiencies to fractional uncertainties of a few percent after 1000 detections. Therefore, using gravitational-wave observations we will be able to unravel some of the mysterious of how binaries evolve.